Ng, C. W. (2018). Education for Mobility – Factual or Fictional. Hong Kong Teachers’ Centre Journal, 17, 99-123. Ng, C. W. (2018). Critical Multimodal Discourse Analyses of News Discourse on Facebook and YouTube. The Journal of AsiaTEFL, 15 (4), 1174-85. Ng, C. W. (2018). Gender Difference in Preferences for Second Language Vocabulary Learning Strategies: A Pilot Study. Bulletin of Advanced English Studies, 1 (2), 160-71. Ng, C. W. (2018). Code-Mixing of Cantonese-English Bilingual Children with Different Language Dominance Patterns. Journal of English as an International Language, 13 (2), 49-80. Ng, C. W. (2018). Assessment for/as Learning in Hong Kong English Language Classrooms: A Review. International Journal of Research in English Education, 3 (3). Ng, C. W., & Zhao, H. (2017). Concept-Based Instruction on English Past Perfect. Journal of Second and Multiple Language Acquisition, 5 (3), 84-98. Ng, C. W. (2016). Impacts of the monolingual and bilingual dictionaries on the lexical errors committed by EFL learners in Hong Kong: a semantic analysis. Lexicography, 2 (2), 143-73. Ng, C. W. (2014). Hong Kong Senior Secondary English Language Curriculum: An Analysis with respect to Multicultural Education. International Journal of Comparative Education and Development, 16 (2), 141-59. Ng, C. W. (2018, December 15). Instruction on the English Tense System through Systemic Theoretical Instruction and Cognitive Grammar. 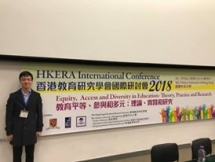 Paper presented at HKERA International Conference 2018. The Chinese University of Hong Kong, Hong Kong, China. Ng, C. W., Hui, L. S., & Leung, M. W. (2018, June 29). Hong Kong Primary English Reading Workshops: A Discursive-Critical Analysis. Paper presented at The 16th Asia TEFL International Conference. University of Macau, Macau, China. Ng, C. W. (2018, June 28). Instruction on English Tenses through Systemic Theoretical Instruction and Cognitive Grammar. Paper presented at The 16th Asia TEFL International Conference. University of Macau, Macau, China. Ng, C. W. (2018, June 27). Acquisition of English Cue Strengths by Cantonese Learners of English. Poster presented at The 16th Asia TEFL International Conference. University of Macau, Macau, China. Ng, C. W. (2018, May 5). Implementation of Task-Based Language Teaching in Hong Kong English Language Education. Paper presented at The International Conference on “English Language Education in the Chinese Context”. The Education University of Hong Kong, Hong Kong, China. Wan, S. W. Y., Tse, Y. S., Wong, Y. Y., Wan, A. W. T., Yung, R. C. H., Wu, M. Y. Y., … Ng, R. C. W. (2018, April 14). Exploring Teacher Leadership for Learning in Hong Kong Elementary Schools. Paper presented at AERA Annual Meeting 2018. New York City, NY. Ng, C. W. (2018, April 13). Acquisition of English Cue Strengths by Cantonese Learners of English. Paper presented at 2018 CAERDA Conference. New York City, NY. Wan, S. W. Y., Ng, C. W. (2018, April 12). Exploring Hong Kong Primary and Secondary School Teachers’ Teaching Efficacy. Paper presented at 2018 CAERDA Conference. New York City, NY. Ng, C. W. (2017, December 18). Acquisition of English Cue Strengths by Cantonese Learners of English. Poster presented at International Conference on Bilingualism: Language and Heritage. The Chinese University of Hong Kong, Hong Kong, China. Ng, C. W. (2017, June 2). Instruction on Tenses through Systemic Theoretical Instruction and Cognitive Grammar. Demonstration conducted at Faces of English 2: Teaching and Researching Academic and Professional English. The University of Hong Kong, Hong Kong, China. Tang, E., Cheng, L., & Ng, R. (2015, June 12). Challenges of Independent Online Learning Community (OLC) at Higher Education. Paper presented at Faces of English: Theory, Practice and Pedagogy. The University of Hong Kong, Hong Kong, China.